Exactly 6 days ago, we publicly said that we were short term bullish risk assets and were sitting on the fence for the medium term. We'd previously been bearish the week before but flipped sides on a turn of a dime. We also stated that we were in the precipice of going bullish for the medium term, and our biases were going to be shaped by the week's price action. 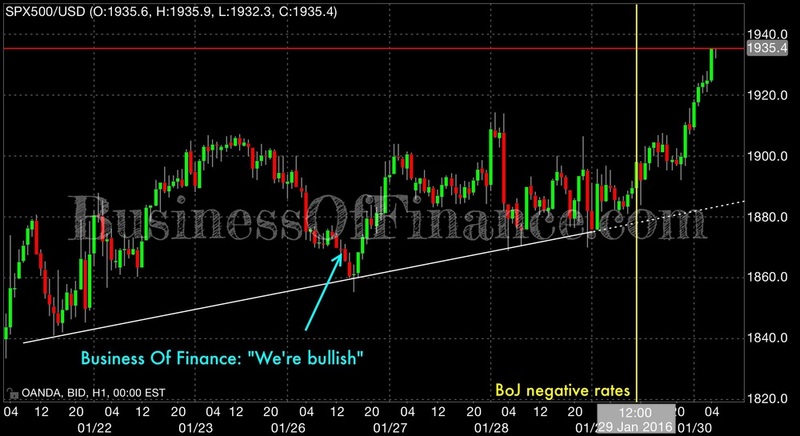 Fast forwarding to this past Friday's close, it seems that we were right on our call. Unfortunately for us, we were shaken out of our long risk positions before the actual rally in prices occurred, so we missed a good part of the ramp. But that's for another story. Readers will know that this isn't the first time we've been right on our market calls. On 25 October 2015, we called the bottom in the U.S. stock market (not to the point but you get what we mean). You're encouraged to read that snippet on how and why we made that particular call if you haven't already done so. Why did risk rally so hard? Long story short, it was a myriad of factors which we believe contributed to the ramp in risk assets. Some of them, as we've mentioned in our last snippet, included technical flows, climatic bearish positioning and sentiment, and good old price action. However, what we didn't foresee (just about no one did), happened as a fresh development and now leads us to be outright bullish risk assets for both the short and medium term. Said fresh development was not from China nor from the U.S., but rather from the land of the rising sun, Japan. During Friday's monotonous trading sessions Asia, the Bank of Japan (BoJ) shocked the world by introducing, for the first time in ages, negative policy rates via a 3-tiered interest rate regime. The BoJ's policy rate had been stuck at 0% for almost a decade now, so no one (and we mean no one) expected a cut into the even darker twilight zone of NIRP (negative interest rate policy). The BoJ now joins the league of central banks that operate in a subzero environment; ECB (Eurozone), SNB (Switzerland), Riksbank (Sweden) et al. On 27 January 2016, we wrote a Snippet titled "Turning On A Dime..." where we said we were adopting a bullish stance on risk assets across various asset markets. The blue arrow in this chart on the SPX (S&P 500 Index) denotes just that. While trading was choppy for most of the week, Friday saw a true shocker of an event when the Bank of Japan (BoJ) surprised markets all access the world by adopting, for the first time in decades, negative interest rates via a 3-tiered interest rate regime where banks would be charged an interest of 0.1% (-0.1% interest) on thei excess deposits held at the BoJ. This development put the yen into a free fall for almost the entire Friday and sent risk assets popping all across the globe. It's fair to say that most participants have not priced this in; while they were sanguine about an increase in the size of the central bank's QQE (quantitative-qualitative easing), just about nobody was expecting negative rates. In the past, markets have mostly been eyeing potential hints that the BoJ increase the scope and scale of its asset purchase program, also known as QQE (quantitative-qualitative easing), which currently sits staley at ¥80trn ($650bn) annually (BoJ seeks to inflate its monetary base by that amount each year). In its last policy conference in 2015, the BoJ made it clear to markets that it had little intention to boost QQE, qualming market expectations. However, as it seems, the highly volatile and unstable financial conditions as of late (chiefly instigated by China right from New Year's Day), has prompted the BoJ to further loosen monetary policy. Hint: It might have something to do with behind the curtains talk at Davos. Was it expected? Absolutely not. Was it logical that it happen? Totally. It doesn't take a rocket scientist to piece together this puzzle, so we'll leave you the reader to figure it out yourself. This snippet isn't about the technicalities and overarching implications of the BoJ's venture into NIRP. Further we shalln't delve. We might pen an article in due course about our in-depth thoughts on the BoJ's latest move, provided we have the time. But for the now, this development is clearly going to be a major driver in risk markets. The price action of the yen is extremely bearish and should continue to stay that way. We've been monitoring positioning in the currency futures market and we're happy to inform yen bears that just 2 weeks ago, bearish bets on risk (proxied by yen longs) were at levels one might deal with a heightened level of alertness. So yes, a huge unwinding of long cash positions coupled with an earnest onslaught back into risk assets should see markets head upwards at least for the short and medium term time frames. Downside risks are obviously still present and very real, but in our eyes, the markets were craving for exactly this sort of fresh development - something from a major central bank along the lines of more easing or even looser monetary policy - and they got just what they were looking for this week. Bears have been slaughtered. Those still left standing should be pinned down pretty soon should they not cover. Reiterating last Monday's bullish call, we're now short and medium term bullish. Bullish level 90%. Trade accordingly.